Are you bored of the *usual* dal that you make almost every other day? then, its time you try this dish. Please, don't let the simplicity of the recipe fool you. 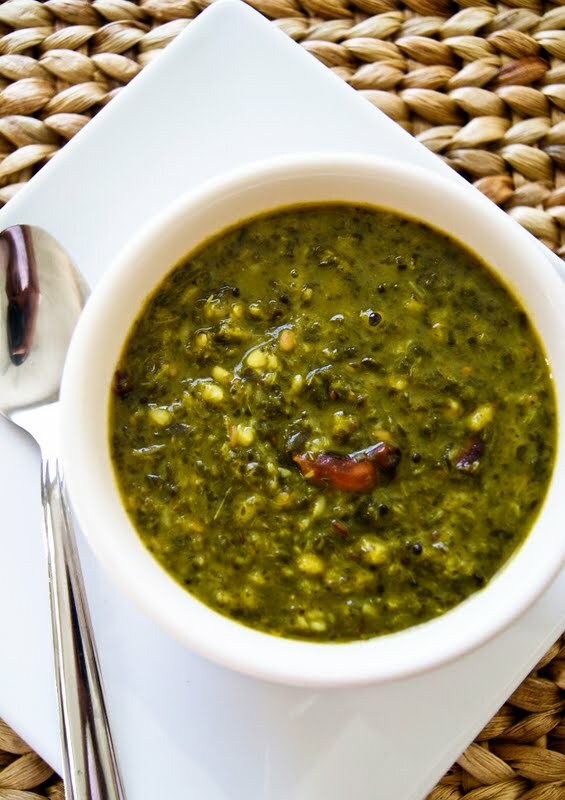 Pureed Amaranth has a nice herby flavor and when coupled with mung dal, the taste is just pure divine. Everybody at S's office loved it and am gonna make it again, today. ..try it, if you don't believe me! 1. 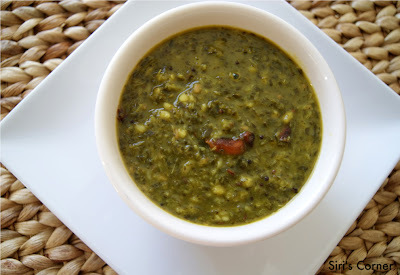 Rinse mung dal. Pressure cook with 2 cups of water for 2 whistles. Set aside to cool off the pressure. 2. Wash amaranth leaves and chop finely. Lightly boil or steam on very low heat, taking care the leaves do not lose their color. Blend or process to a puree. Set aside. 3. Heat oil in a skillet. Add mustard seeds, cumin seeds, urad dal, halved red chilli and asafoetida powder. When the mustard seeds start to splutter, add pureed amaranth. Mix and cook for 3-4 minutes, covered. Finally add cooked dal, season with salt. Mix well and gently cook for 6-7 minutes on medium-low heat. Serve hot with rice and ghee. Yum! Note: Amaranth leaves can be found in produce section of any Indian stores. A nice variation is to use Spinach leaves instead of amaranth leaves. This is my second entry to MLLA 25, this month hosted by yours truly. My first entry was Makhani Dal. Only 3 days left to send in your entries!!! Siri, that looks lovely and delicious. This sounds so good and healthy... Nice recipe.... YUM! That is lovely Siri. I don't think I have ever used or eaten Amarnath leaves. Not even sure where to get them. I bought the Amarnath grain the other day but am not sure it is the same thing. Thank you Chandana, Priya and Sukanya for your sweet comments. I am glad you like the dish. Masial is so integrated with Tamil cuisine and great way to include greens in our diet. Looks Scrumptious Siri. One of my favourite, just love it with pickles and rice..yummy..
Looks so fresh and yummy! Love this healthy dish. Healthy greens..perfect for hot steamed rice! This looks amazing Siri! Unfortunately I 've never seen amaranth leaves here in Austria, any idea what I could substitute? Sasa - Thanks :). Any kind of green like - Spinach, Sorrel leaves can be substituted for Amaranth leaves & it will taste equally yummy.